Thomas Mann’s observation that “a person lives not only his own life, but also that of his contemporaries”, applies to everyone, but perhaps even more to writers and poets because they feel and speak for us even when we are not able to put into words our deepest feelings, and sometimes are not even conscious of them until a poet or a story writer tells us. Writers respond to what goes on around them and to the mood of the times. As thinkers, they occasionally express ideas and views that do not always find acceptance. This brings writers into conflict with the powers that be. Books are banned and even pulped — as in the case of Wendy Doniger’s book on Hinduism. Authors are physically attacked and even killed for their writings. Salman Rushdie was forced into hiding for many years because of death threats. In conditions where writing is stifled, the form evolves and morphs to find expression. Less often, writers protest by means other than their writings, for example, by turning down an award or taking to the streets and, even less occasionally, by returning an award. The recent phenomenon of more than 40 writers (and counting) returning the Sahitya Akademi and other awards is not only unusual, but also deeply symbolic. Like politicians and actors, writers, too, now make “breaking news” only when they do something dramatic. Punjabi writer and journalist Gurbachan Singh Bhullar pointed out in a recent interview that “There is nothing new in what is happening to writers and artists today. These kinds of killings and events have happened in the past (for example, when MF Husain was attacked and chased out of the country). In the past, too, right wing terrorists attempted to suppress artists and culture, but because of vote-based politics, the government remained at most silent. But what is happening now is that the current government’s MPs and ministers are openly endorsing the attackers and opposing the writers.” Bhullar decided to return the Sahitya Akademi award only when he felt a point of no return had been reached. The early years after India’s independence sought to emphasise the role of writers and artists in building the post-independence State. That India’s first prime minister was an accomplished writer himself helped in building institutional support for writers and culture in general. In a country that elected for itself a by-and-large liberal constitution, albeit in a highly illiberal and unequal society, artists and poets were seen to be necessary to establish a liberal State, in addition to the institutions of Parliament and the judiciary. Though the philosophical bedrock was supposedly “liberal and inclusive Hinduism,” this idea has been questioned most stridently (and for many, convincingly) in recent years by Dalit activists and ideologues. A more plausible reason is that a multi-cultural and fragmented country can only be glued together through the notion of a liberal State. Democracy is not a perfect system — it works only if the counterweights are applied by either one of the two main institutions, or by external pressure groups such as the media or artists. Whenever there has been a real or perceived attack on the liberal idea, many among these groups have been the first to take action. This resistance seems to have been missing in the recent past in the light of the well-grounded perception that the liberal State is under a renewed attack. Universities and academic institutions, often at the mercy of the government of the day, have become mute spectators as they have much to lose for standing up, unlike what happened in the United States during the McCarthy era when universities solidly supported their professors in the face of political fear mongering. A large section of the media is now corporate and profit-based and not always seen to be standing up to the powers at the moment. In the past, theatre, and even cinema, provided an outlet for expressing anguish. Sahir Ludhianvi’s “jinhe naaz hai hind par woh kahan hain” provided a scathing critique of the disparities in Nehru’s India and the disappointment that many felt at the time. There was an indirect impact of artistes groomed by the socially-conscious underpinnings of the Indian People’s Theatre Association (IPTA). In the current environment, film artistes and others associated with popular culture have, for the most part, adapted to the demands of the market. Once considered to be visionaries and the “unacknowledged legislators of the world” poets and writers have now been upped by businessmen who are the new “visionaries” and “role models”. Nevertheless, they continue to write and question in the face of the present dispensation, characterised, as it is, by deep-seated anti-intellectualism and glorification of the supremacy of medium over substance. An addiction to Facebook and Twitter cannot supplant the quest for deeper knowledge. A fascination for technology driven by the profit motive is not a substitute for science that is driven by curiosity and questioning of commonly-held views. Rationalists like MM Kalburgi and Narendra Dabholkar feel unquestioned belief in mythology and superstition needs to be combated. This very questioning, however, made them suspect. 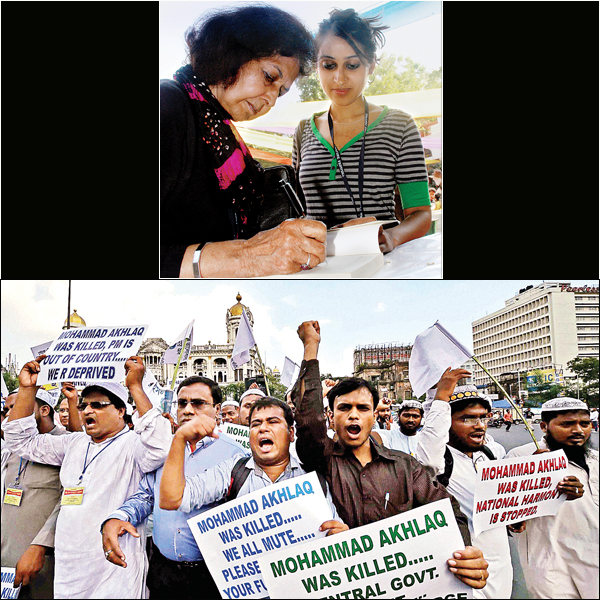 Kalburgi and Dabholkar were killed because they were perceived to be a threat — exactly like Galileo was to Church dogma. It weren’t only his revolutionary scientific breakthroughs that posed a threat to the Church’s hold over the people’s minds, but the fact that he wrote not in esoteric Latin but in the common people’s language, Italian, and reached out to the masses, posing a threat to the most powerful institution of his time. The targets, therefore, are not just Kalburgi and Dabholkar, but the ideas they upheld and tried to disseminate in languages common people understand. These are not isolated events — these are happening as part of a larger project of converting India into a Hindu nation, backed by corporate financial muscle. It is in this backdrop that more than 40 writers have returned their awards. One can question the technicality of the timing and point of returning an award that is instituted by a democratically elected literary organisation, but what cannot be ignored is the anguish. The writers feel that the State’s institutions are not doing enough about — and even abetting — the slide into illiberalism, if not fascism. It is significant that around a quarter of these protesting writers are from Punjab, a state hardly known for its contemporary literary achievements. There are local reasons for this phenomenon: most of these writers have braved the years of the 1980s Khalistani movement and state terrorism with great resilience and courage. Some, like Avtar Singh Paash, Dr Ravinder Ravi, Sumeet Preetlari and VN Tiwari, among many other intellectuals, were killed by Khalistanis. The writers from Punjab are thus a lot more sensitive to the current attacks that are eerily reminiscent of the late 1980s Punjab. Despite the then Indian government’s questionable actions and the Indian State’s use of reprehensible violence, they believed that the idea of liberal India would survive. Their sensitivities to religious and theocratic fanaticism were shaped by those years of quiet and courageous resistance. This faith seems to have been shaken. Events, particularly in the last year or so, have generated fear in anyone who does not fall in line with Hindutva groups. The impact of protest registered through writings takes time, even if it is more lasting. For now, in the age of instant television’s thirst for a new event every day, the impact of making the headlines by returning awards is no less significant in highlighting the grave threats to a liberal and inclusive society. This post first appeared at the DNA website.